MOSCOW, June 26. /TASS/. The Russian Northern Fleet’s Project 955 underwater missile cruiser Yuri Dolgoruky has successfully test-fired a Bulava missile from the Barents Sea and hit all the designated targets at the Kura practice range in Kamchatka, Russia’s Defense Ministry reported on Monday. "The Project 955 Borey-class underwater missile cruiser Yuri Dolgoruky has made a successful launch of a Bulava intercontinental ballistic missile from the designated area of the Barents Sea towards the Kura practice range in Kamchatka. 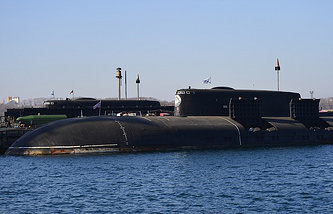 The launch was made from the submerged position in compliance with a combat training plan," the Defense Ministry said. "The parameters of the Bulava intercontinental ballistic missile’s flight trajectory were practiced in the normal regime. According to the confirmed data of the registering equipment, the warheads of the intercontinental ballistic missile performed a full cycle of the flight and successfully hit the designated targets at the practice range," the Defense Ministry said. 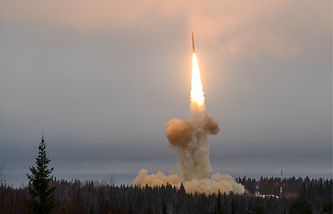 The previous launch of a Bulava missile was carried out on September 27 when the submarine Yuri Dolgoruky performed an experimental salvo launch of two ICBMs from the White Sea towards the Kura practice range in the Russian Far East.